In 2002 a quiet revolution occurred in Indian design: the ‘Design in India’ Yahoo e-group was born. It was the original online community for Indian designers and academicians and the first time that people across generations and geography could interact in a single space. A decade later and email seems old-fashioned when the options to interact are endless: blogs, micro-publishing platforms, social networks and social sharing tools make it easier than ever before to reach out to your compadres and clients. Despite the convenience of cyber connections however, Indian designers are doing one curious thing in 2012 than they have ever done before: they’re travelling long distances to meet each other in person. The last year has seen an explosive growth in the number of design conferences being organised in India and an equally explosive growth in the number of people attending them. The big daddy of them all, Kyoorius Designyatra has close to 1300 delegates attending this year and is one of the largest design gatherings in the world. The Unbox Festival and India Design Forum in early 2012 saw considerable participation across a range of city-wide events in New Delhi while more modest conferences like the Pune Design Festival reached out to design students in India’s largest university city. Professionals, design academics, students and aficionados, all of whom could easily connect over digital media have made an effort to be a part of the developing conference scene. So what is it that brings them out to Goa to an event like Kyoorius Designyatra? 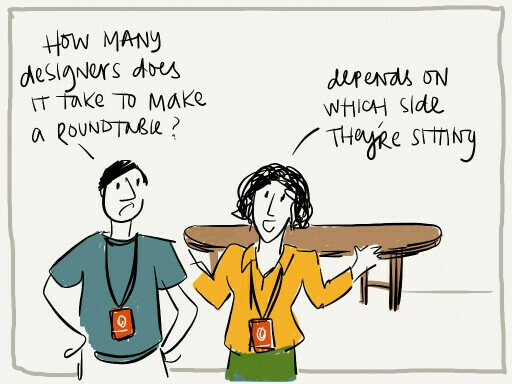 Whether people attend design conferences to socialise, meet their heroes or participate in wider conversations about design, it’s plain to see that the Internet does not provide an alternative to personal interaction. If anything, social media and online publishing have encouraged designers to seek each other out in more meaningful ways, to cut through the clutter of work and discover the people behind the portfolios. Sure, you could watch an online video of a design legend deliver a talk, but where else can you share a cup of chai afterwards? For the real stuff, theres nothing to beat actually being there. * This essay was written as part of the Design Writing workshop hosted by Kyoorius and British Council India at Designyatra 2012 in Goa.